FOMC Statement: December Rate Hike Still on the Table? The Fed has spoken! Did the U.S. central bank change its mind about hiking rates before the end of the year? And where will the U.S. dollar go from here? Hey, that rhymes! As I’ve laid out in my FOMC preview article, one likely scenario was that policymakers would refrain from announcing any rate changes for now while keeping a 2015 liftoff on the table. While Fed head Janet Yellen didn’t explicitly say that they’ll be tightening monetary policy in their next and last rate statement in December, she also didn’t dismiss this possibility entirely. In other words, FOMC policymakers can neither confirm nor deny that a December interest rate hike is happening. The Fed said that business and household spending is solid from their earlier assessment that it is just moderate. And here’s the kicker: Fed officials hinted that a bit more progress in terms of employment and inflation might be all that’s needed to give the green light for a rate hike in December. “In determining whether it will be appropriate to raise the target range at its next meeting, the Committee will assess progress–both realized and expected–toward its objectives of maximum employment and 2 percent inflation,” the official statement showed. For some analysts, this implies that a December interest rate hike is the default scenario, unless of course the next batch of U.S. economic data disappoints. Keep in mind that Uncle Sam has a couple of NFP reports on the docket, along with two more sets of inflation releases (CPI and core PCE price index), before the December 16 FOMC meeting. Mark your calendars, people! Aside from these, upcoming GDP releases and the minutes of this particular monetary policy meeting (due Nov 18) could also be crucial for the Greenback’s forex trends. Downbeat data could dash hopes of a December liftoff but if the reports meet or beat expectations, dollar bulls might keep charging until the end of the year! 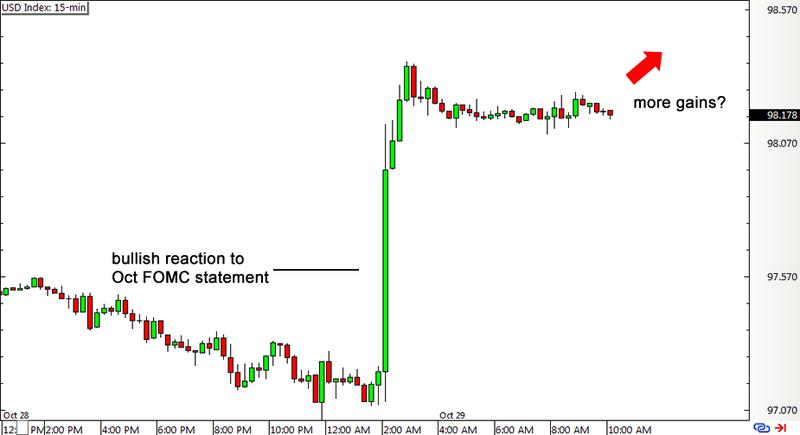 What’s your take on the latest FOMC statement? Are you looking forward to a December rate hike?